The course is set on a flat terrain with total 27 holes, comprising of 3-nine holes courses. They are named Aroona, Binnowee & Wangara Course. The Aroona & Binnowee Course hosted The Austrian Ladies Masters. These two 9 hole courses were designed by Tomojiro Maruyama. They have wide fairways and are relatively easy despite being long with total yardage of 7185 yards. 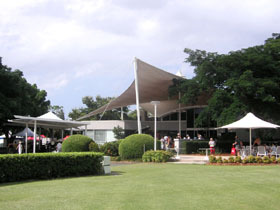 Wangara Course which was designed by Graham Marsh was added in 2005. This 9 hole is relatively short with 3221 yards, par 36. The fairways are squeezed and the greens have fair undulations. Along with well-positioned bunkers, accuracy is the key to success. This time, I did not play the Ladies Open Course but the Binnowee & Wangara Course which was recommended by the caddy master. As recommended, Wangara was an absolute delight to play. A straight long par 5. Since trees and a lake protect the right side of the fairway, a left to right players need to pay an attention. A big green is guarded by a bunker on the right and a lake on the left. A straight hole. Lakes on both sides of the fairway and a bunker 240 yards from the tee are in play off the tee. Since this hole is long, distance off the tee is important. The lakes of both sides of the fairway are connected by a creek wich crosses the fairway 50 yards in front of the green. The green is wide and gives you ample room to target. A beautiful hole over a lake. The contrast among the lake, the green and bunkers is fantastic. A sharp dogleg to the left. The left corner bunker is 225 yards off the tee. You need to be careful because there is a blind lake on the left hand side of the bunker. A big bunker is waiting around 90 yards in front of the green. Good course management to avoid this bunker is required to get by with a low score. A dogleg to the left. The left side bunker is 220 yards off the tee, and a right side bunker 240 yards. These bunkers squeeze the fairway as they limit the landing area of tee shot. The narrow and deep green is slightly elevated. It takes 1 hour from Brisbane Airport and 20 minutes from Suffers Paradise by car. This golf course is located in a resort complex. A big tennis tournament was going on at the resort's tennis courts the day I played. Anyone can play from the longest tees. Yardage sticks are measured in meters. A GPS golf cart is very convenient to show distance and your exact position with respect to greens, bunkers and water hazards. The course was ranked 97th in Australia by Golf Digest 2004. Tomojiro Maruyama designed courses in Japan are Kobe Royal Pines GC and Myoukou Pain Valley CC. Another designer, Graham Mash, has designed about 50 golf courses mainly in Australia and Asia. As far as Asia is concerned, Penang GR, Tropicana G&CC, Penang GR and Staffield CR and Stera Harbour G&CC are his designs in Malaysia. Fairways & Bluewater RG&C and Royal Northwoods G&CC are in Philippine. Gading Raya Pading GC is in Indonesia. Silk River CC is in Korea, BFA International Convention Center (博鰲論壇亞州国際会議中心)GC is in China. Mission Valley GC, Kagoshima Gaden GC and Karuizawa 900 C are in Japan and Robina Woods GC is in Australia.